Some of you may know of my girly girl crush on Jemaine Clement. Dan's going to make me a t-shirt with him on it that I'm looking foward to. Well, he is in one of my new favorite movies, Eagle vs. Shark. It didn't come to the theaters here in Mississippi. Go figure. Well, it came out on dvd when I was home for Christmas. Dan and I went to the Blockbuster here to get it and, what do you know, they didn't have it here. CRAZY. They did order it for us, so we only had to wait for a week to see it. 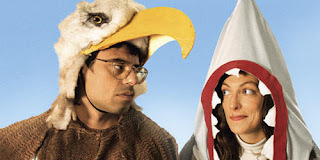 So, you lucky Hattiesburgians out there, go rent Eagle vs. Shark. Give Jemaine some love. I was the first to rent it in Pleasant Grove. He is yummy! I love that he punches the guy anyways.